May 17 is World Baking Day and the general theme behind world baking day is to ‘bake something for someone you love.' That's a concept I can endorse without reservation. Whenever I bake or think about baking, I think about my grandma and it's always an exercise in love. Sharing baked goods is hands-down my favorite way to express love and appreciation. This week building up to World Baking Day, I teamed up with some other bloggers and the folks at Granite Mill Farms to bring you original, tasty recipes using sprouted grain flours – baked items (savory and sweet) that you can share with someone you love. 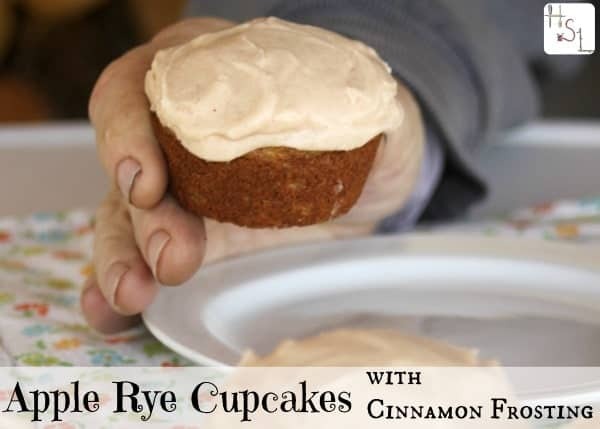 I baked up these Apple Rye Cupcakes with Cinnamon Frosting and well they were a total hit. I hope you'll think about baking some up for a loved one soon. I'm a big fan of the flavor of rye but please note these are not going to taste anything like rye bread for folks who simply don't like that flavor. There is something really delightful about apples and whole grains to me and these sprouted grains are full of crunch and healthy goodness. Whole grains sometimes get a bad wrap in making dense baked goods and I know, I've had those brick-like whole wheat brownies, too. These cupcakes, however; are light and airy in texture while being full of bits of apple and delicate sweetness. 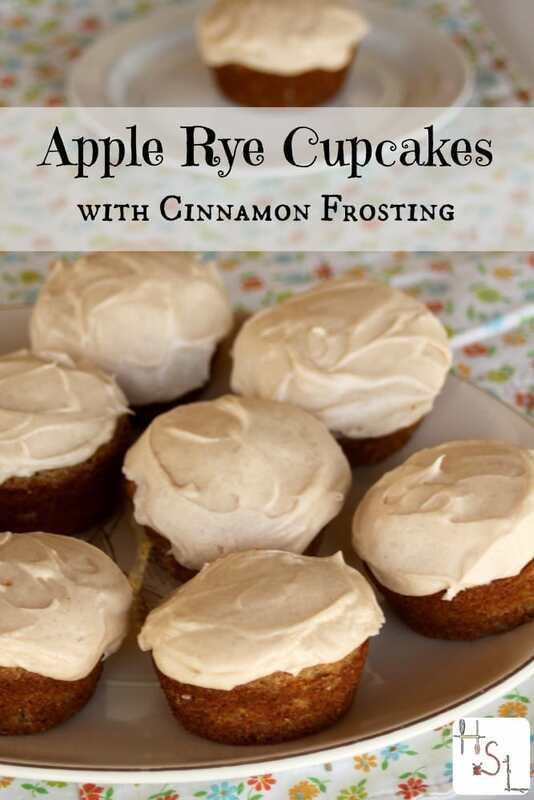 Bake up some of these apple rye cupcakes with cinnamon frosting for someone you love today! Preheat oven to 375 degrees. Grease muffin tins or line with cupcake papers. Sift together the flour, salt, and baking powder. Set aside. Whisk together the sugar, oil, eggs, and apple juice. Add the wet ingredients to the dry and stir until almost combined. Fold in the chopped apples and mix everything until thoroughly combined. Pour into muffin tins, filling about 3/4 full. Bake in preheated oven for 15 minutes. Cool in pan 5 minutes before removing to wire rack to cool completely. Cream the butter, add the cinnamon, and powdered sugar. Mix slowly, add apple juice a little at a time and continue mixing until desired consistency is reached. Frost as desired. The sprouted flour in this recipe was graciously provided by our sponsor Granite Mill Farms. Be sure to check out my other World Baking Day Partners: Angi from SchneiderPeeps who made Sprouted Spelt Snickerdoodles – Chris from Joybilee Farm who made Maple Hazelnut Butterhorns with Cream Cheese Frosting – Jami from An Oregon Cottage who made a Dark Chocolate Spelt Cake with Chocolate Ganache – Liz from Project Pastry Love who made Blue Cheese & Candied Walnut Crackers – Lynda from Me and My Pink Mixer who made Raspberry Dark Chocolate Spelt Bread – Rhonda from The Farmer's Lamp who made Rosemary Saltine Crackers – Sheila from Life, Love, and Good Food who made Skinny Parmesan Twists – Susannah from Feast and West who made German Pretzels – Wendy from The Monday Box who made Honey Sesame Cookies. I’ve never been a fan of rye but maybe that’s because I’ve only had store bought rye bread. But these sound wonderful! Thanks so much for sharing. I honestly believe most people don’t like rye because they don’t like caraway seeds, which seem to be in most versions of rye bread commercially made. I could be wrong but I know that proved to be true for me. I never liked rye bread until I had it without caraway and since then I’ve been a fan. I can’t wait to hear how it turns out for you! Cinnamon, one of my most favorite spices. I buy organic sticks and grind them fresh I like it so much. I’ve never thought of putting it in frosting, but how delicious that sounds. Can’t wait to try these. Kathie, first of all, I want to thank you for organizing World Baking Day. I was so happy to be apart of this wonderful group of bloggers. Secondly, THESE LOOK SO YUMMY! Well done! I love adding to my real foods dessert board – thank you for another great recipe! Oh man, Kathie! You did it again. These cupcakes look so very incredible. Thanks for coordinating this great collab!